The September 1934 issue of The Pottery Gazette and Glass Trade Review features a full-page color advertisement devoted to “Casino” by Royal Doulton. This modern shape debuted a few years earlier and came in three patterns: “Marquis,” “Radiance,” and “Envoy.” Pictured in the advertisement is the earthenware tureen seen here in the museum’s collection. 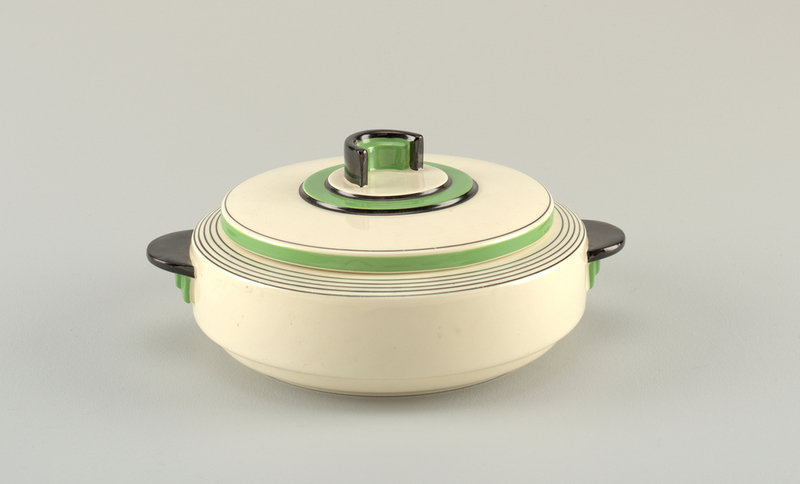 Decorated with simple bands of green, black, and platinum, the pattern is called “Radiance,” and in the 1934 advertisement it appears with a matching tea pot, coffee pot, milk pitcher, and platter. The Casino shape was described as having “unusual handling devices” that give it a “pleasing effect.” Looked at from above, the tureen’s quirky semicircle handle beautifully contrasts with its decorative circular bands and lines. This tureen exemplifies the “new style” that emerged in tableware design in Britain during the 1920s and 1930s. During Britain’s interwar years geometric shapes and patterns flourished among many of Britain’s leading potteries. Most designs appeared in earthenware rather than porcelain, appealing to a budget-conscious younger consumer more inclined to enjoy the look of these modern wares and with a lifestyle that did not require a traditional porcelain dinnerware service. Today Royal Doulton continues to manufacture tableware. Founded in 1815 in London by Martha Jones, John Doulton, and John Watts, it was then called Doulton & Watts. The pottery originally sat on the banks of the River Thames and manufactured salt-glazed and stoneware ceramics. The company flourished during the mid-nineteenth century and was at the forefront of the Sanitary Revolution due to its innovative design and use of stoneware drain pipes and water filters. In 1854 Watts retired and the company became known as Doulton & Company. In 1860 the company expanded its production to include tableware with the recruitment of students and recent graduates from the Lambeth School of Art as designers. In 1882 the company began producing wares in Burslem in Stoke-on-Trent, Staffordshire, the historical home of the pottery industry in England. In 1887, Queen Victoria knighted Henry Doulton (who had been with the company since 1835) for his service to the ceramic industry on both industrial and artistic fronts. In 1901, Edward VII permitted Doulton & Company to add “Royal” to its name and the company continued to make well-designed and decorated ceramic tableware through the twentieth century. The Casino shape, in all its varying patterns, is one example of the playful and modern designs produced by Royal Doulton during the 1920s and 1930s that furthered the company’s legacy for well-made and beautiful ceramic designs. Tureen, "Casino" shape and "Radiance" pattern, ca. 1930; Manufactured by Royal Doulton (Burslem, Staffordshire, England); Glazed earthenware; Gift of Denis Gallion and Daniel Morris, 1994-118-9-a,b.